It has been two years since Rose Katz, 83, came home after an extended stay at North Shore University Hospital in Manhasset, N.Y. Back in December 2016, she was rushed to the emergency room after her heartbeat slowed and her body temperature dropped to 91 degrees. Her heart stopped twice while at the hospital, where physicians discovered a blockage and implanted a pacemaker. After more than a month at a rehab facility, Katz returned home on Valentine's Day 2017 and was enrolled in Northwell's House Calls program. The program is part of a Medicare experiment to see if healthcare providers can save money by bringing primary care into their sickest patients' homes. Katz, who also has severe arthritis, receives visits to her Flushing home from her doctor or a nurse practitioner as well as a social worker. Northwell coordinates at-home medical testing, such as chest X-rays, along with physical therapy and home health aide services. "They come to our house. It's much more convenient. Look at the weather outside," Katz said on a February day that brought snow, sleet and rain. 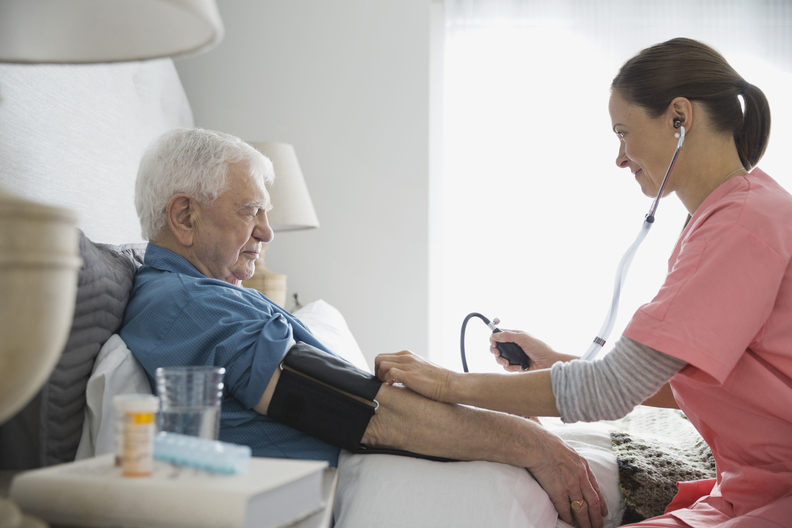 The idea of receiving health services in the home is an attractive one for seniors who might have impaired mobility or poor access to transportation. But Medicare's pilot program for home-based primary care is limited. This year it increased the total number of patients who can enroll to 15,000 from 10,000. To qualify, patients must be Medicare beneficiaries with two or more chronic conditions and need help with daily activities, such as walking or eating. They must have had a hospital admission and rehab stay within the past 12 months. Northwell can send a nurse or a doctor to make a same-day visit to see a patient or dispatch paramedics in an emergency, allowing the paramedics to consult with a remote physician to decide whether a hospital stay is necessary. The idea is this: With intensive home services, chronically ill patients will have less need for expensive hospital care, which is often followed by a rehab stay and could result in nursing home placement. "What we've done is built a care model that is incredibly responsive to patients and families," said Dr. Kristofer Smith, senior vice president of population health management at Northwell Health. The program, Independence at Home, has come with a financial benefit to Northwell, one of 12 participants nationwide. Data released in January for the third year of the program, which ran from June 2014 to May 2015, showed Northwell lowered medical spending by 21% compared to expectations, saving Medicare $2.4 million. Northwell received a reward payment of $1.2 million for that result and for meeting quality standards by limiting patients' emergency department use and following up with patients within 48 hours of a hospital visit. At that point the program was treating 396 patients in Queens and on Long Island. From 2012 to 2015, the most recent year of data, Northwell was awarded about $2.7 million in all. But some things aren't covered by the program. Katz still must visit specialists, and she goes to North Shore twice a year to have her pacemaker calibrated. But her physician and social worker are very responsive to calls and emails, said Renee Katz-Packer, her daughter. "This program should be much more mainstream," she said. "It shouldn't be so mysterious. There shouldn't be waiting lists. People should have the opportunity to have what we got to have." Smith said it's not yet feasible to widen the pool. "We need to be thoughtful about making sure we're not expanding beyond the populations for whom we know it works because you will dilute the results," he said. A bill that has been considered in the U.S. Senate would expand the Medicare benefit to cover home-based primary care. Private Medicare Advantage plans have begun to form contracts with primary care practices that do house calls as more evidence suggests they can save plans money. Northwell isn't the only provider in the area offering such a service. A Brooklyn medical practice, Doctors on Call, is part of the Medicare pilot, but it has yet to save the government enough money to receive a financial reward through the program, which it is navigating without the financial backing of a regional health system like Northwell. Mount Sinai has operated its own home-based primary care program, Visiting Doctors, since 1995. It wasn't eligible to participate in the Medicare pilot, but it manages a patient group of about 1,500 people with serious health conditions who get home visits by doctors. About 250 people are on a waiting list to enroll. The program limits its patients to those with severe health conditions. "We serve home-bound patients," said Dr. Linda DeCherrie, director of Visiting Doctors. Research published last year in the Journal of the American Geriatrics Society supported the idea of expanding Medicare's Independence at Home pilot. If Medicare had expanded the program to allow participants to sign up 50,000 patients, rather than 15,000, the federal government would have saved an additional $46 million in two years, the study found. Even greater savings could be generated by opening home-based primary care up to all 2.4 million Medicare recipients who meet the stringent eligibility criteria, the study found, and that could result in a 10-year savings of $1.8 billion to $10.9 billion after Medicare paid out rewards to high-performing medical providers. "Independence at Home shows there's enough savings to do this type of care," said Dr. Bruce Kinosian, a co-author of the study and an associate professor at the University of Pennsylvania's Perelman School of Medicine. As for Rose, she hasn't been back to the hospital except for her routine pacemaker checks. Rose's husband, Isidore, said the House Calls service has kept the couple together in their home of 40 years. "That is the biggest help they gave us," said Katz, 93. "Enabling us to stay in the house." "Northwell shows savings in Medicare pilot testing house calls" originally appeared in Crain's New York Business.